From the moment we set foot in this home, we knew the kitchen needed a personality to match the homeowners’ colorful style and whimsical art collection. This one-of-a-kind space is now the perfect personality-filled hub for cooking and gathering. Texture and materials played a big role in establishing the style of this contemporary Queensbury kitchen. A variety of materials layer, while a open and uncluttered layout keep the space from feeling overworked and busy. 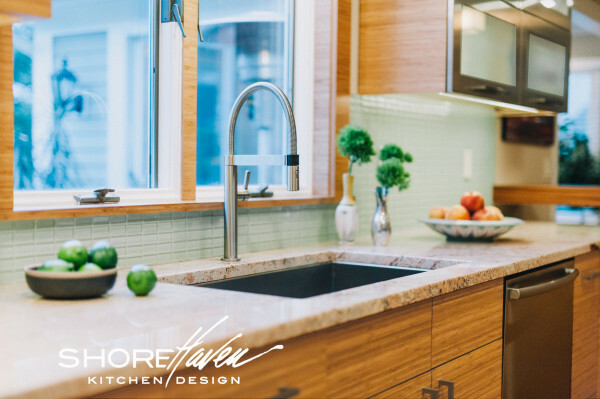 Simple slab-style cabinetry and sleek hardware sets the stage for a mix of bamboo, wood, glass, granite, and stainless steel finishes that create visual interest. 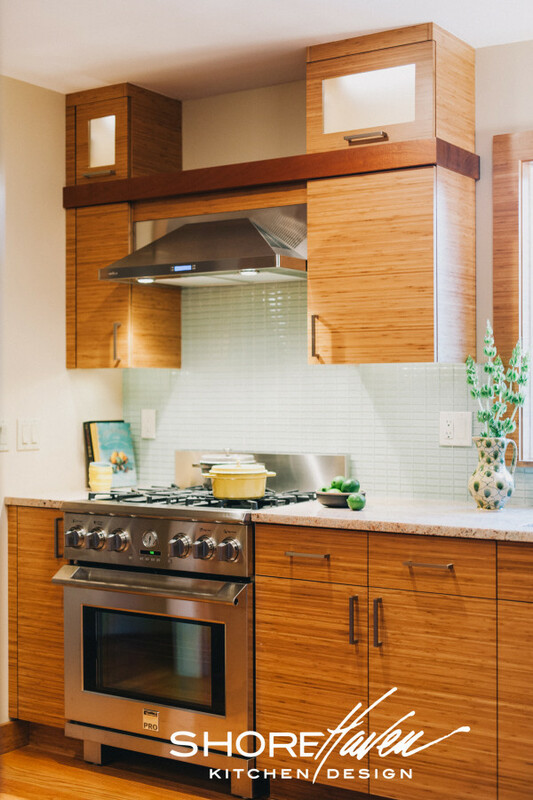 Patterns and textures are emphasized in the linear design, as horizontal lines carry throughout the kitchen’s bamboo cabinetry by Crystal Cabinets. Acid-etched glass panels in stainless steel frames fold-up to reveal everyday dishware. 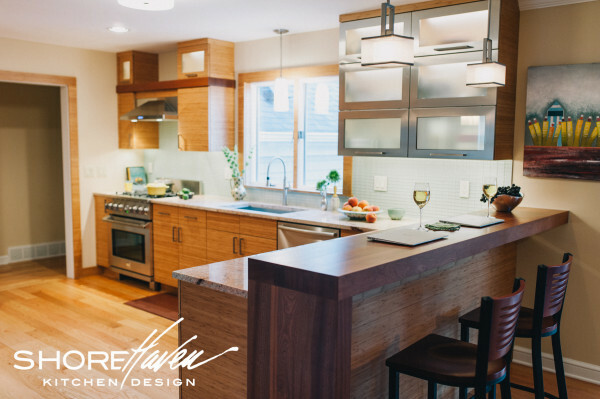 A floating bar-top adds a graphic element to this contemporary kitchen, while still providing a functional space for friends to gather. 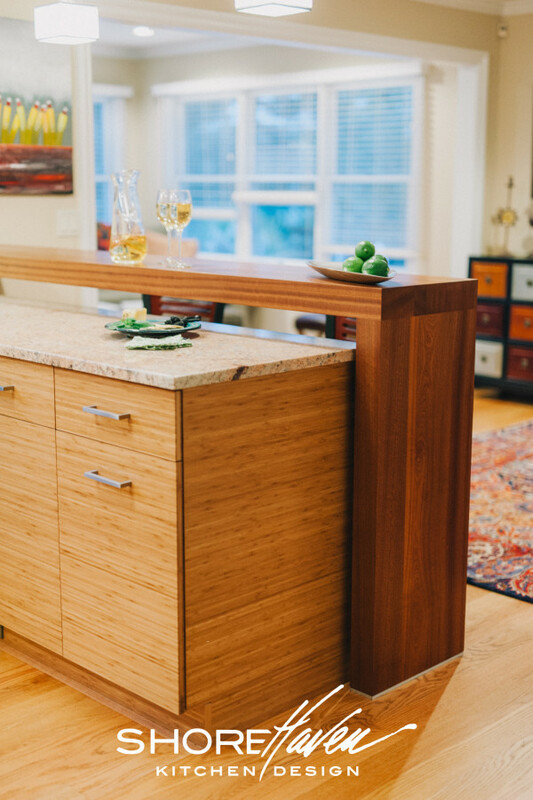 The custom bar-top and aluminum brackets were made in house by Jason Henderson. Light reflecting glass tiles keep the backsplash area looking uniform and clean. The recycled bottle green tiles are laid in a less conventional, stacked horizontal grid pattern (think excel spreadsheet), creating more interest for the eye. 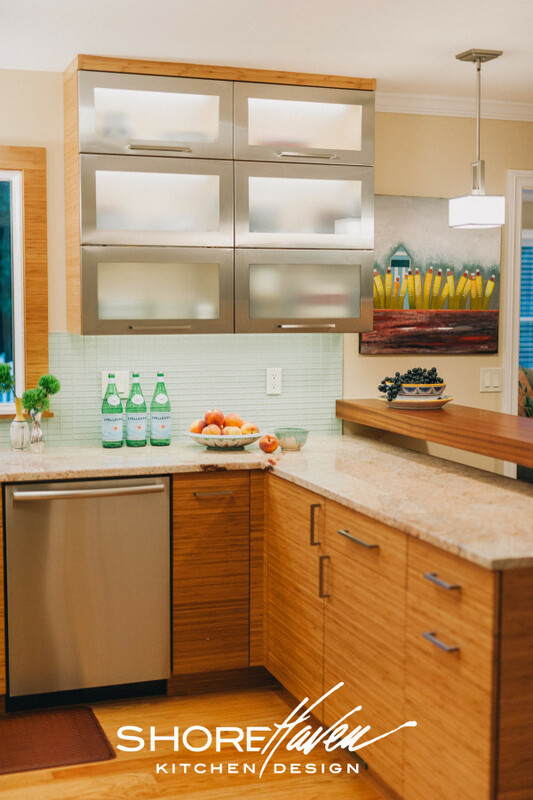 Warm colors keep this modern kitchen from looking too cool. 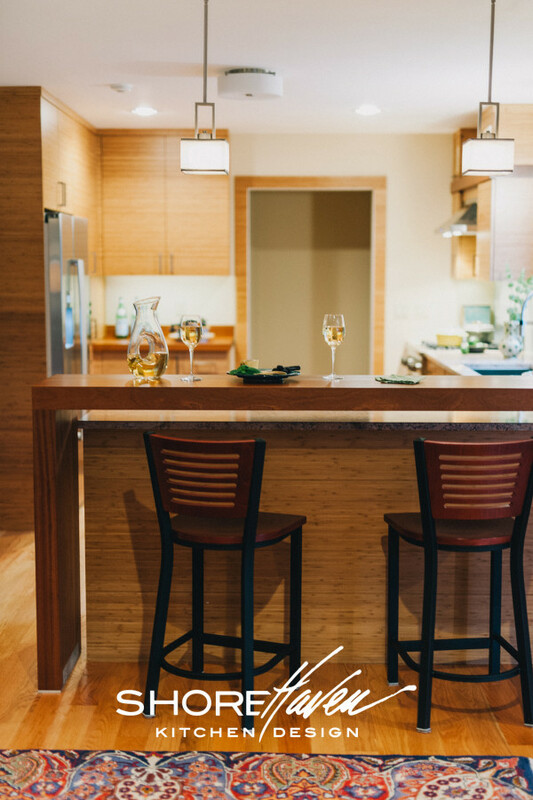 Frameless flat-panel cabinetry and stainless-steel appliances set the contemporary tone, while rich reddish-browns in the sapele wood counters, soft peaches in the granite counters and pale beige walls add a sunny glow. 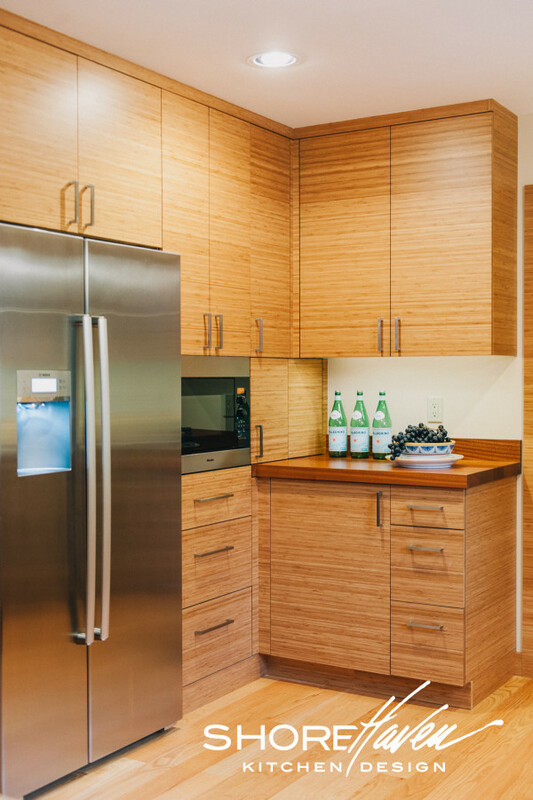 Flush doors of bamboo cabinets continue seamlessly against the wall, incorporating plenty of storage (and even the refrigerator and microwave) into an uninterrupted span. 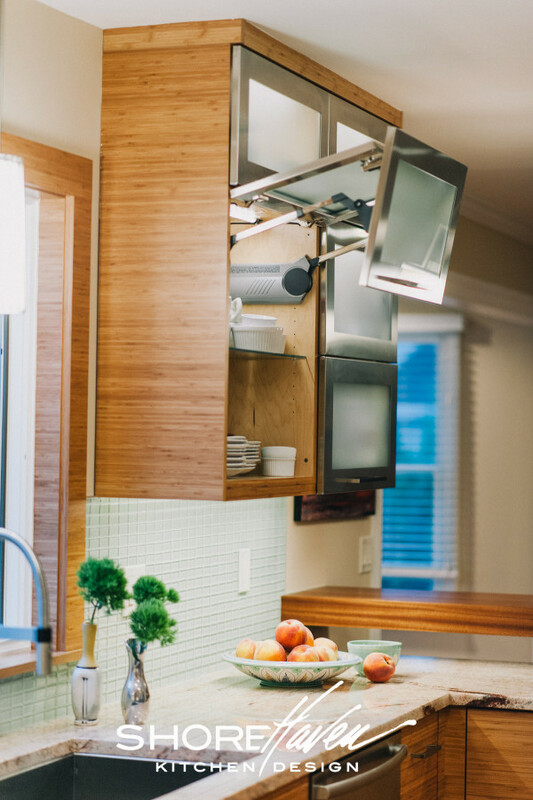 From concept to creation, this kitchen turned out just as we’d envisioned—striking the perfect balance of Manhattan style in Upstate New York. Want to know where more stuff came from? Lights by Kichler Lighting and Murray Feiss. Backsplash tile and dimensions grout from Queensbury Tile. Faucet and sink by Blanco.